Love her deer. Great work. Happy PPF to all. I love Emma's work. Congratulations! This deer was one of my favorites last week!! So glad it's features! Way to go Emma! Oh this is truly magical! I missed this last week, such a beautiful piece! ooohh emmas work its so beautiful,congratulations. happy ppf and a great weekend you all. 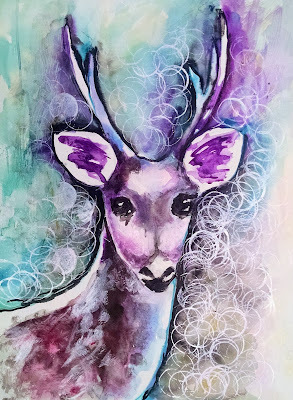 What a wonderful deer, love the colours the circles around it look so pretty. Fabulous work Emma.. Such a beautiful creation! So glad to see Emma as featured artist. I love this painting of Emma's - the colours and texture and of course the subject matter! All of you are such an inspiration. Many thanks. Congratulations Emma, it's a stunning painting. Happy Friday all! oooh, what a gorgeous painting by Emma to feast our eyes upon this week! Happy PPF! This is a magical picture of a deer! I have visit of real deeres, they have eaten up all my violets. Emma's deer was one of my favorites. Absolutely love it! Thanks, as always for hosting! Love your use of the tp holder for the circles. Great painting on every level. Oh how I love this fairytale deer! Wonderful!! Oh Dear, love this lovely!! Awesome :) I love deer! Congratulations on being featured this month. Inspiring deer. I love being a part of Paint Party Friday. I put two links in this time--I forgot to get them in on time, I hope you don't mind. I've missed all the comments and encouragement from my fellow artists. You are all so sweet and fine. Thank you again for hosting PPF and for the featured artist--wow! Wonderful work!